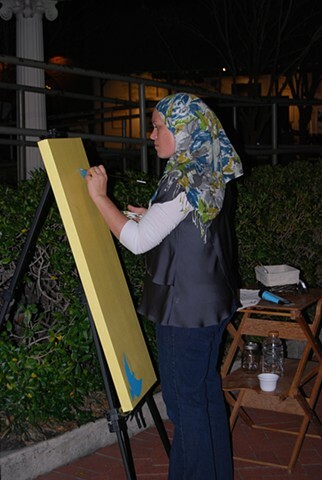 During Artwalk Gainesville in December 2012 I began my paintings "Birds, not Bombs." You can find a photo of the finished painting in the "Commentary" section of my site. The painting was inspired by the quote "Birds, not Bombs", which I had heard a few months earlier. The final painting has the Arabic word "Salaam" (which means "peace") written in the bottom of the canvas, with doves flying undulating circles to the top of the piece. The birds are decorated with traditional henna/mehndi patterns, and surrounded by swirls and metal finishings.